The channelized E1/ISDN Primary Rate Interface (PRI) modules are available with one or two E1 ports with balanced or unbalanced interfaces and are compatible with the International Telecommunication Union Telecommunication Standardization Sector (ITU-T) G.703/G.704 specifications. The channelized E1/ISDN PRI modules receive and transmit data bidirectionally at the E1 rate of 2.048 Mbps and provide up to 30 virtual channels per E1 port. Refer to the Fast Ethernet Plus Channelized E1/PRI network modules. Each port is configured independently. 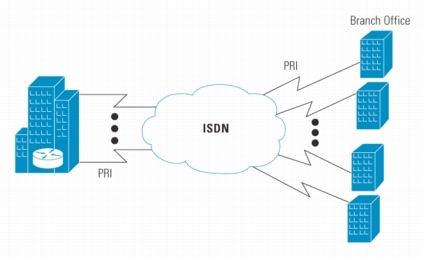 You can configure one port for ISDN and the other for channelized E1. Supports framed G.704. Refer to Understanding 1 and 2 Port E1 Multi-Flex Trunk Voice/WAN Interface Cards (VWICs) for unframed G.703. They are available in balanced 120 ohm and unbalanced 75 ohm. Each requires different physical hardware. You cannot add hardware to an existing card in the field in order to upgrade. Note: The Cisco IOS Software releases provided are typically the minimum version required in order to support the platform, module, or feature in question. Use the Software Advisor ( registered customers only) in order to choose appropriate software for your network device: match software features to Cisco IOS and CatOS releases, compare IOS releases, or find out which software releases support your hardware. On the 1- or 2-Port ISDN PRI/Channelized E1 Network Module, the interfaces are addressed as controller <slot>/<unit>. Concurrent ISDN BRI and PRI module support requires Cisco IOS Software Release 11.3(3)T.
Refer to Configuring Channelized E1 and Channelized T1 for configuration assistance. Configure the interface as you normally would a Channelized E1/PRI interface on any other router. Networking Professionals Connection is a forum for networking professionals to share questions, suggestions, and information about networking solutions, products, and technologies. The featured links are some of the most recent conversations available in this technology. The astonishing versatility of the Cisco 2600, 3600 and 3700 router series is highlighted by its broad support of Integrated Services Digital Network Primary Rate Interface (ISDN PRI) connectivity. The available Cisco 2600/3600/3700 PRI network modules provide various port densities to meet customer requirements at various price points. The optional, integrated CSU lets customers consolidate customer premises equipment (CPE) to provide multifunction dial access server, router, and other capabilities within the Cisco 2600/3600/3700 series in power branch office environments. The balanced and unbalanced serial connectivity options enable conformity to a customer's specific application. Note: The 2600 and 3700 Series only supports PRI network modules without a LAN connection. Note: The 3631 Series is not supported. For midrange, high-density ISDN PRI applications, the Cisco 2600/3600/3700 provides superior performance and port densities. For example, a fully configured Cisco 3640 can support 8 ISDN PRI ports in one chassis, which can be multiplexed to provide up to 192 T1 channels at 56/64 kbps T1, or 240 E1 channels at 56-64 kbps. These PRI and FE/PRI network modules support the 3600 and 3700 internal digital modems in the 3600 and 3700 for PRI, CT1, and R2 connections. This allows up to 30 V.90 modems in a 3620 or 60 V.90 modems in a 3640. LEDs-Network module status indicator, status LEDs, including carrier detect, local/remote alarm, and loopback. Network interfaces-All supported by Cisco 3700/3600/2600 LAN Routers.